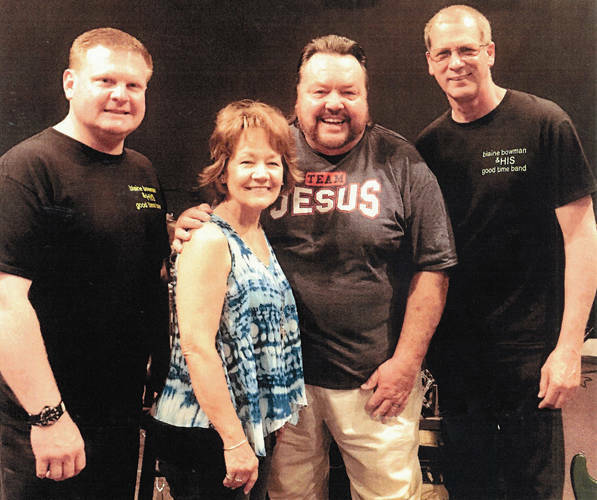 Steven Lake, Christine Bowman, Blaine Bowman and Mike Turner, members of Blaine Bowman and HIS Goodtime Band, are all set to perform Dec. 15 at the Gospel Music Center in Union City, Indiana. UNION CITY, Ind. – “God’s idea of a good time” is how Blaine Bowman describes his programs. Bowman will bring his group to the Gospel Music Center at 340 N. Howard Street in Union City, Indiana at 7 p.m. Dec. 15. There is no admission charge. A love offering will be taken. Bowman has shared the gospel in word and song at more than 160 venues this year. He will go anywhere and everywhere from his annual “Party at the Ranch” to car shows, city parks, biker events, special church events and a festival in Florida that drew 1,500 people. Bowman’s group is a family oriented group performing with his wife, Christine, grown children, spouses, and grandchildren soon to be growing into the group. Everyone is invited to join for a fun evening of “making a joyful noise.” The next program will be Joelle York on Dec. 20, an evening of Christmas carols. For more information, call 937-423-6335 or 937-467-9305, email terryandraine@gospelmusiccenter.com or visit gospelmusicenter.com. Bowman can be reached: P.O. Box 100, South Lebanon, OH 45065; by phone at 513-479-6700, by email at treemendus1@msn.com or his website at blainebowman.com.